Fairland Street 1900 and now. Part of the touring exhibition – Tradition and Innovation: The Story of Market Towns. Visitors to the exhibition can enjoy seeing stunning archive photographs and listening to the voices of shopkeepers past and present. Visitors will also have the opportunity to handle real artefacts that would have been found in markets and shops from the Victorian era to the present-day. Each of the first four museums to host the exhibition will also be running a special family day, where local families will get the opportunity to create their own cardboard shops. The exhibition features specially commissioned ‘ghost’ photographs by Nick Stone (thas me, I didn’t write this), a Norwich-based photographer. 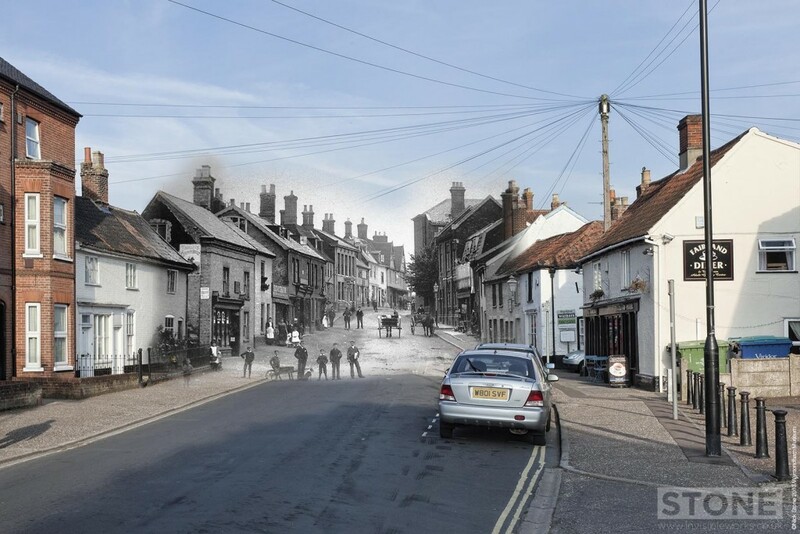 Stone (that’s me that is again) used computer software to merge archive images of shops with his own present-day pictures to demonstrate changes that have taken place in the high street over the last century. 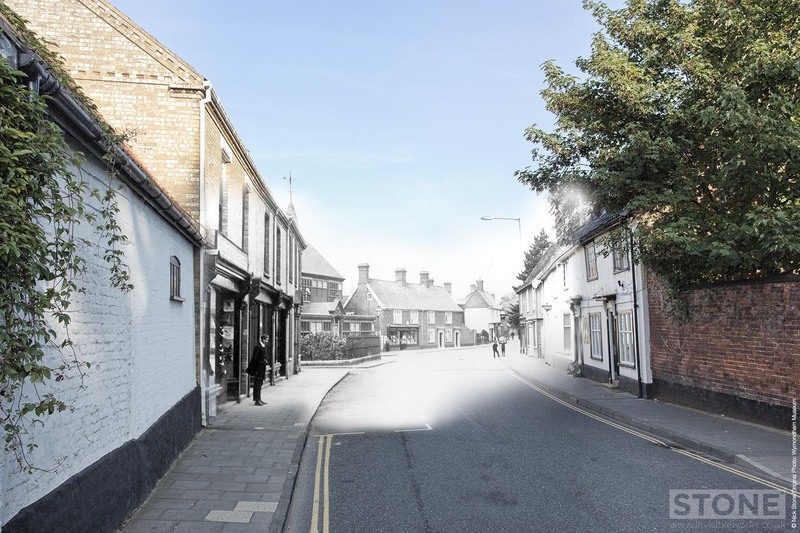 Tradition and Innovation: The Story of Market Towns will be displayed Sheringham Museum (November 2013 – March 2014), Diss Museum (March – September 2014), Swaffham Museum (September 2014 – February 2015) and Wymondham Museum (February – July 2015). he got a dickey pullen uh cart hent he. 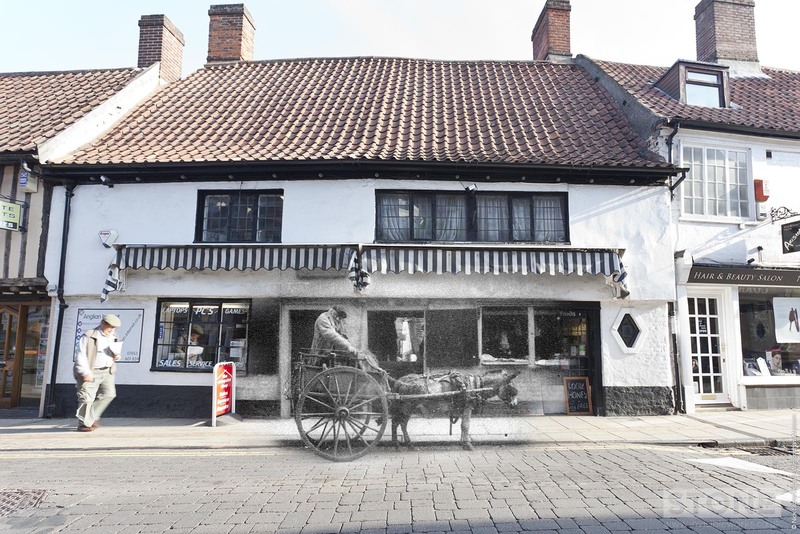 Walter Lane outside his shop up at Town Green in Wymondham. Now Middletons so I’m led to believe. A nice bit of Wymondham history, the war memorial on the corner was fenced in once, always makes me wonder where the metal went, wonder if it was reclaimed in WW2? All composite images © Nick Stone 2014, original images copyright respective owners (Wymondham Museum) Not to be reused without explicit permission.